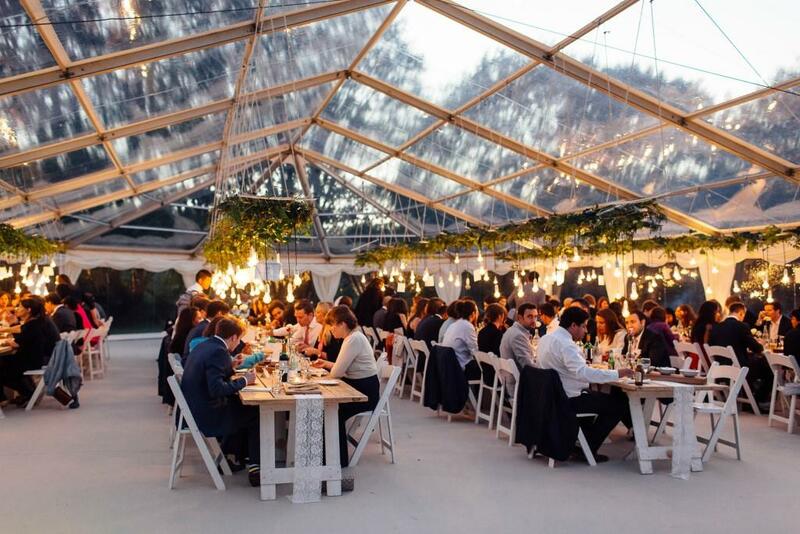 Weddings are all about romance and celebration so you really want your marquee to look beautiful and to be an inviting space for your guests. 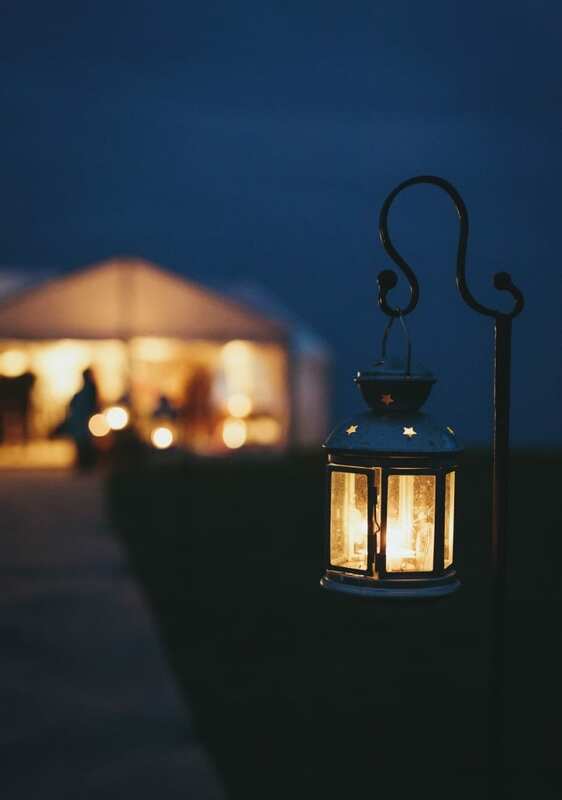 Lighting is key to creating atmosphere and in this blog we take a look at some of the options available to help you get your wedding marquee looking just perfect. 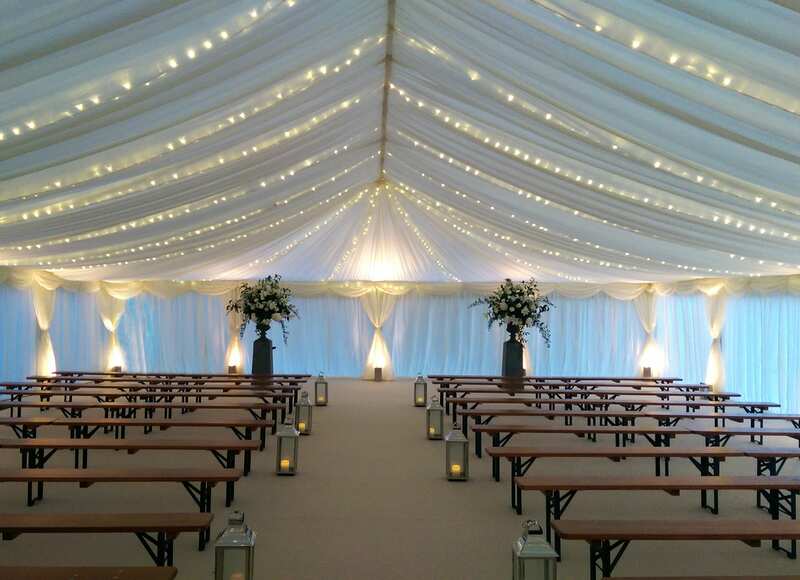 All marquees need some element of functional lighting and this can come in the form of pendant lights, chandeliers or up lighters – all can be installed on dimmer switches so that the light can be set to suit the time of day/night. We tend to favour up lighters as they sit at the base of the linings and up light the walls of the marquee creating a subtle but practical background light. Other more functional lighting might be required for catering tents (strip lights), or to light car parks, paths to toilets where a floodlight can be installed. 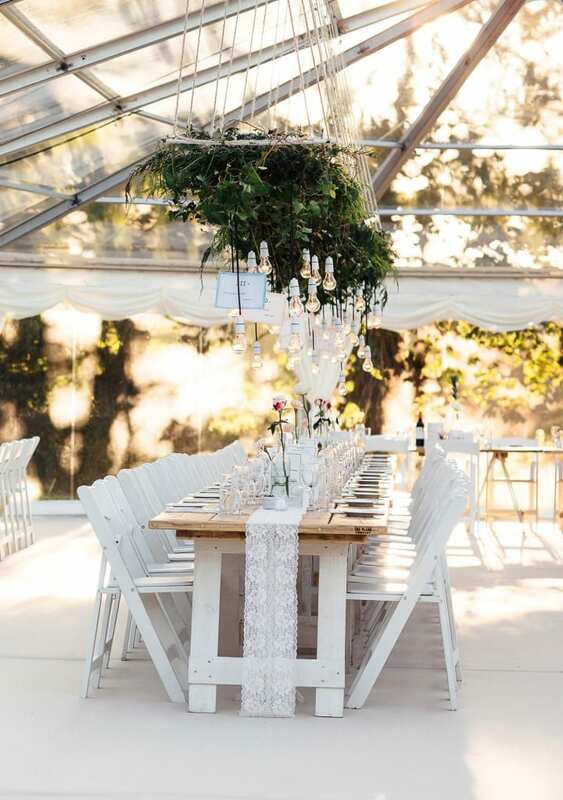 Chandeliers: add a bit of glamour to your marquee with chandeliers, great for creating a stylish traditional wedding marquee or for adding a bit of elegance to the roof space in a clear roof marquee. 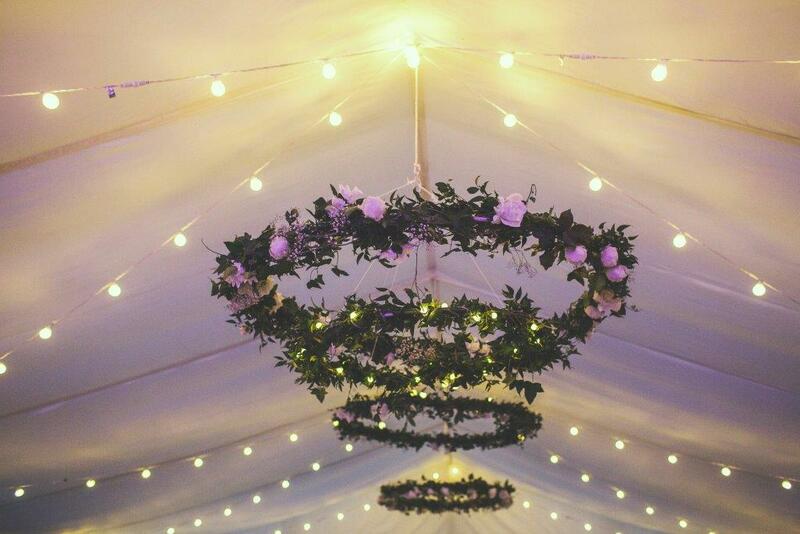 Fairy Lights: can be used behind the roof linings to give a pretty romantic look – these look great day and night. 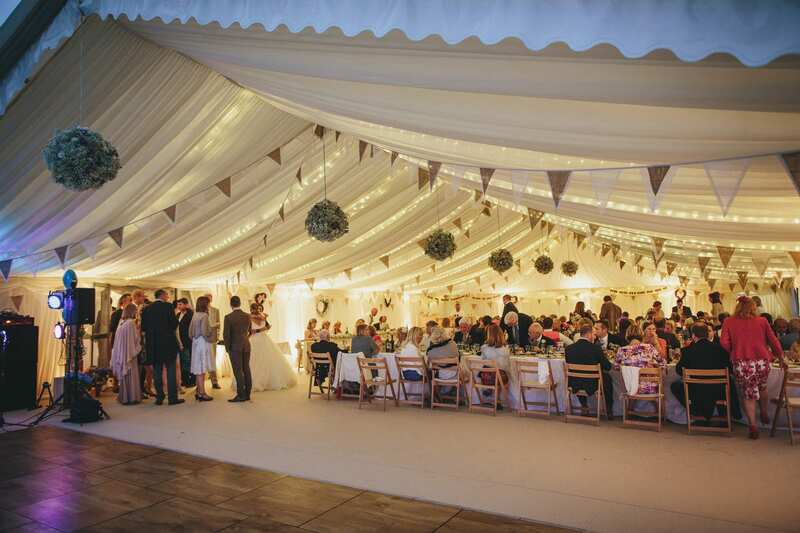 Festoon Lighting: traditional large bulb lights can be strung in the roof space below the marquee linings on a dimmer switch. 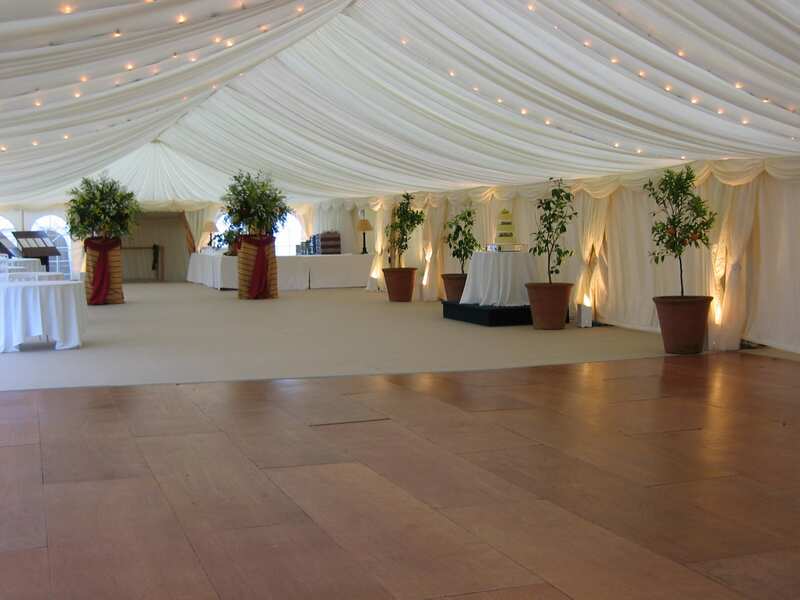 By day or night it adds atmosphere and works really well with flat marquee linings as shown below. Alternatively they can be strung from the roof space along with fairy lights behind the linings to give a fantastic mix! 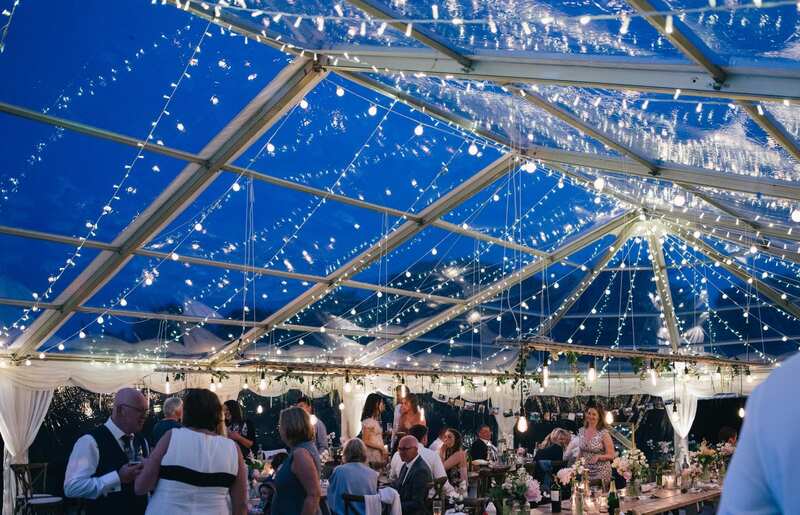 It looks brilliant whether you opt for linings or have a clear roof marquee – plenty of twinkle! Starcloth Linings: for pure twinkle factor, starcloth linings look fabulous! White starcloth is pretty and romantic whilst the black starcloth is usually used over a dance floor to add a bit of drama! 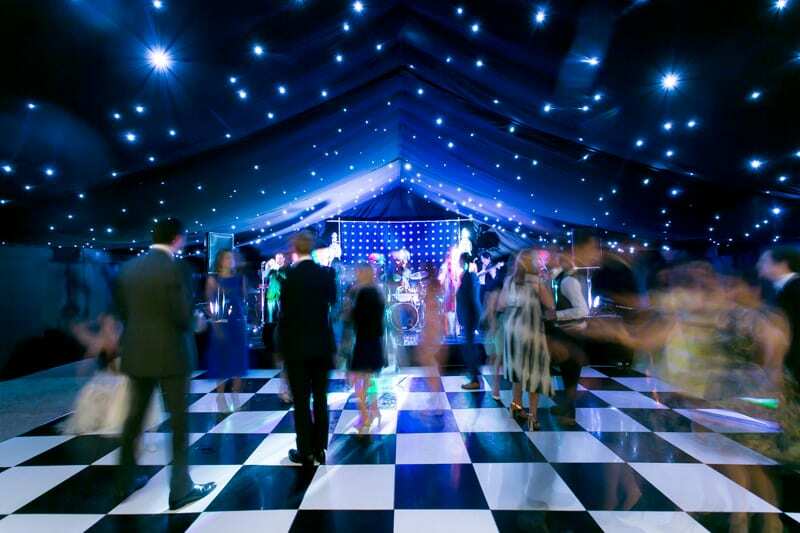 Dividing curtains can be used during the day so that dance floor area is hidden and then when the time comes you can make the big reveal for the evening celebrations. 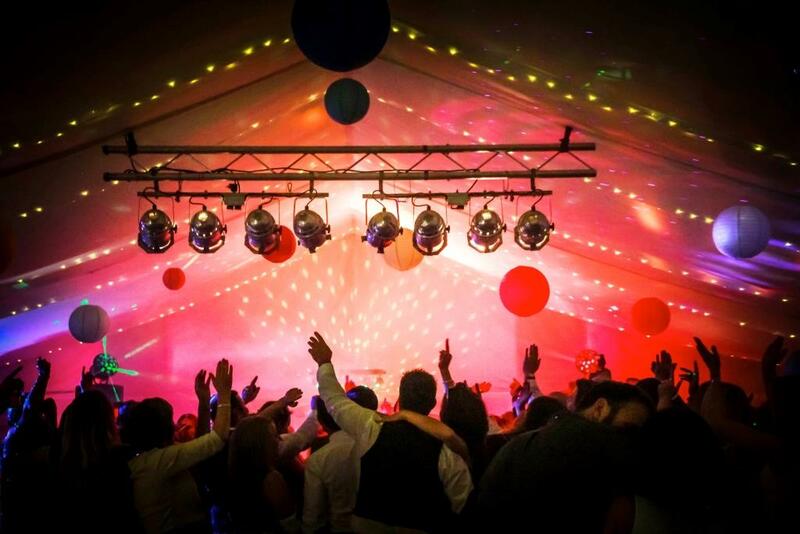 Lighting Rigs: if you are having a band or doing your own music and just want to get the party started then how about adding a lighting rig for great party atmosphere – it is sure to get your guests dancing all the night! Paper Lanterns: These have grown in popularity in the past few years and are a great feature often adding colour as well as light to the roof space. They can be used with small battery operated lights so they glow as the evening draws in. Hanging Greenery & Lighting: for total ‘wow’ factor your lighting can get completely theatrical and look simply amazing. 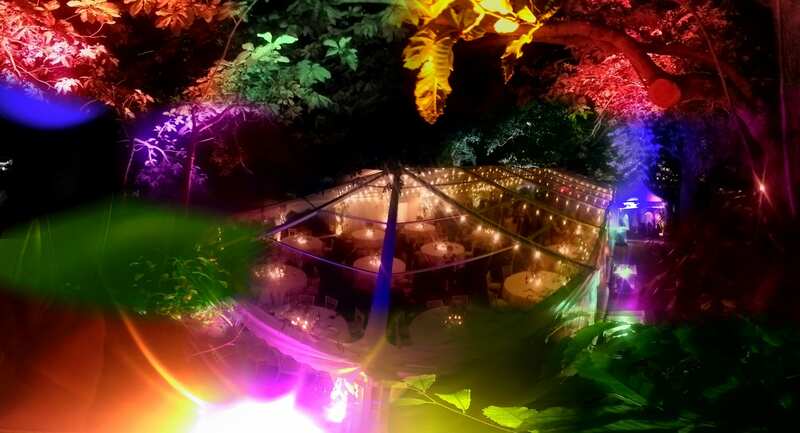 Combing foliage on a suspended structure with hanging lights creates a spectacular feature to your marquee by day and night. Candles: there is something special about a candelabra decorating tables at a wedding reception, but you can also get creative and use candles to make your own personal centre piece to suit your theme. Candles won’t add much light but are great at adding to the romance. Table Lights: Here’s a lovely idea – glass bottles filled with led fairy lights! 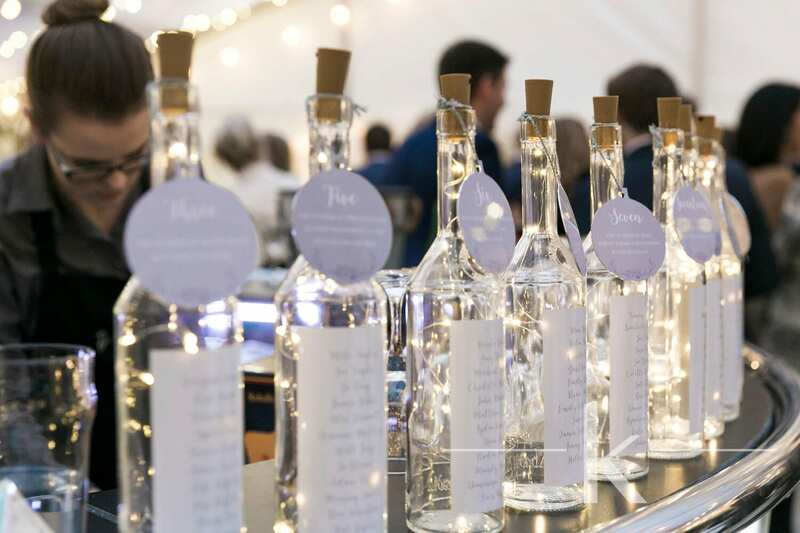 In this photo the bottles have been used as table plans which can then decorate each table. So effective especially for a wintry wedding when the evenings are darker much earlier. 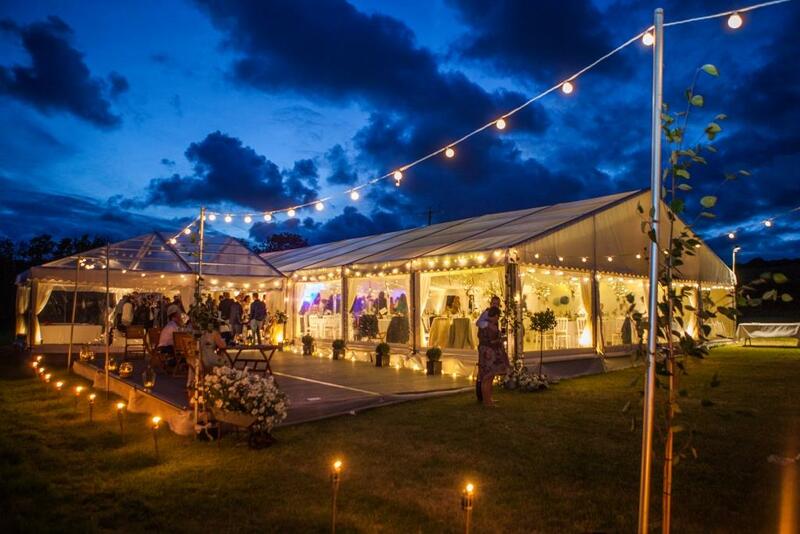 Don’t forget to think about lighting outside your marquee, for both practical and decorative reasons. 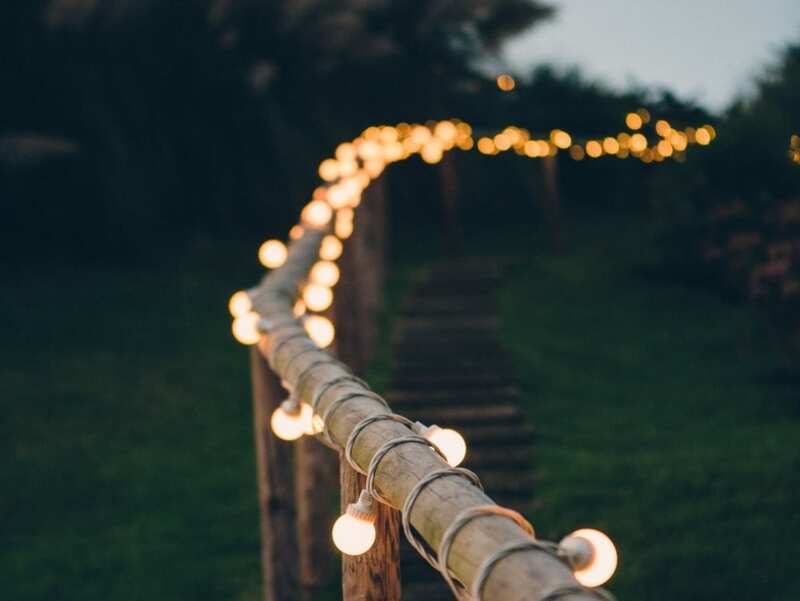 You can really add to the ambiance by lighting an outdoor area or help welcome evening guests by lighting a pathway. 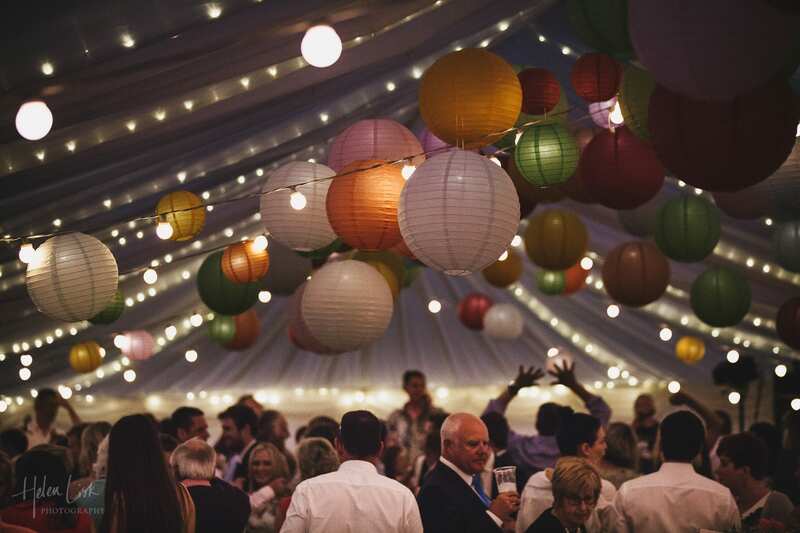 Festoon Lighting: strung on poles these lights can be used to light any outdoor space adjacent to the marquee or to light a pathway to/from the marquee. 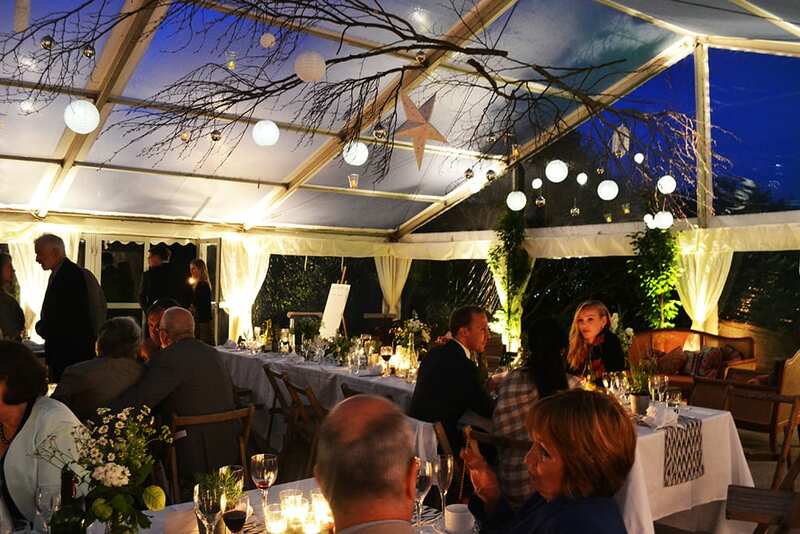 Lanterns: similarly lanterns can be used to highlight a path of to edge an outdoor seating area. MBI’s : light up trees or buildings with MBI’s to bring your outside in. With clear roofs the affect can be quite amazing at night, both inside and out! 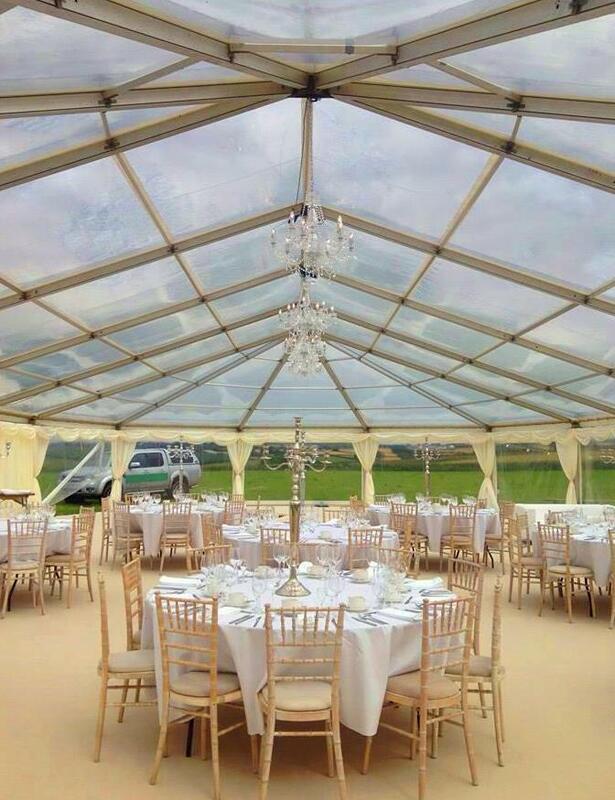 So have a think about what will work for your marquee, the space you have, your surroundings and how you want your marquee to look! 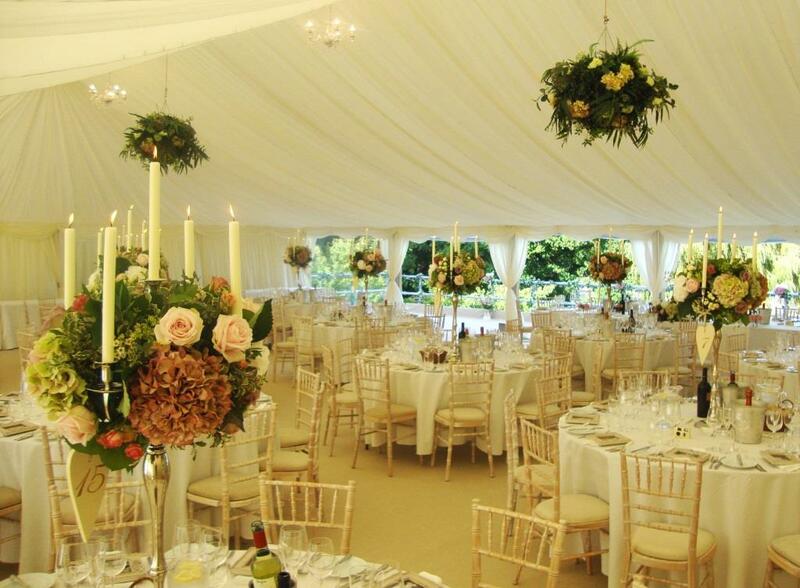 For a bit more inspiration take a look at our pinterest pages – it’s a great way to get ideas for decorating your marquee! 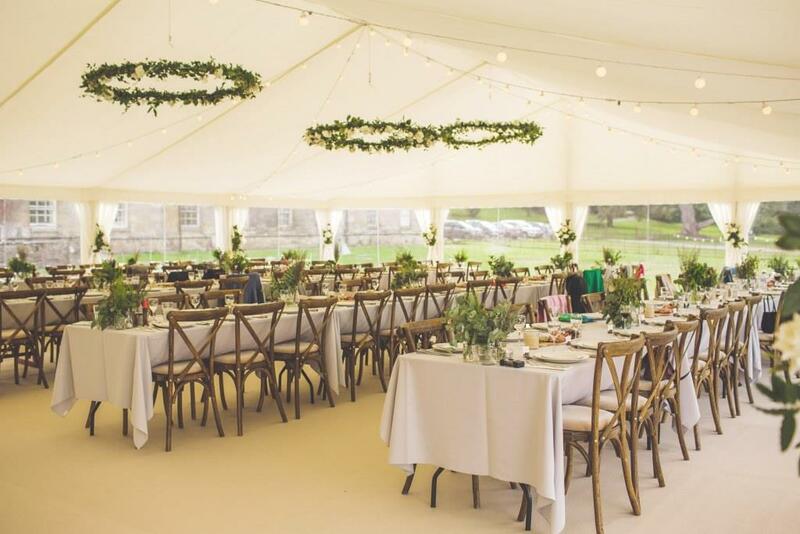 Or for more information on marquee hire in Devon, Cornwall, Dorset and Somerset visit Hatch Marquee Hire, specialists in wedding marquees.